A complete guide to current model 4-seat or more convertible cars and SUVs offering the best in today's top-down choices for open-air driving fun. Convertible cars provide the ultimate driving experience. Cruising alongside the ocean, driving through a tropical forest, even crossing a desert, convertibles allow you to enjoy all your senses. Whether you choose to call yours a roadster, cabriolet, ragtop, spyder, droptop, volante or simply a convertible, own one and you'll never go back. Here is a list of convertibles with your requested features: Seating: 4-Seats Or More; Production Status: Current Models; use the selections at the left to change the convertible cars displayed. The 2018 Aston Martin DB11 Volante is a softtop convertible with 2 passenger doors and seating a maximum of 4 people, with a price starting at $216,495. Running on Premium, the DB11 Volante gets 18 MPG City, 24 Highway MPG, for a combined 20 MPG. The 2018 Aston Martin Vanquish S Volante is a softtop convertible with 2 passenger doors and seating a maximum of 4 people, with a price starting at $312,950. Running on Premium, the Vanquish S Volante gets 13 MPG City, 21 Highway MPG, for a combined 16 MPG. The 2018 Audi A3 Cabriolet is a softtop convertible with 2 passenger doors and seating a maximum of 4 people, with a price starting at $38,350. Running on Regular, the A3 Cabriolet gets 25 MPG City, 33 Highway MPG, for a combined 28 MPG. The 2018 Audi A5 Cabriolet is a softtop convertible with 2 passenger doors and seating a maximum of 4 people, with a price starting at $49,600. Running on Premium, the A5 Cabriolet gets 24 MPG City, 34 Highway MPG, for a combined 27 MPG. The 2018 Audi S5 Cabriolet is a softtop convertible with 2 passenger doors and seating a maximum of 4 people, with a price starting at $62,300. Running on Premium, the S5 Cabriolet gets 20 MPG City, 29 Highway MPG, for a combined 23 MPG. The 2017 Bentley Continental GT Convertible is a softtop convertible with 2 passenger doors and seating a maximum of 4 people, with a price starting at $218,400. Running on Premium, the Continental GT Convertible gets 14 MPG City, 24 Highway MPG, for a combined 17 MPG. The 2018 BMW 230i 2 Series Convertible is a softtop convertible with 2 passenger doors and seating a maximum of 4 people, with a price starting at $40,750. Running on Premium, the 230i 2 Series Convertible gets 24 MPG City, 34 Highway MPG, for a combined 27 MPG. The 2019 BMW 430i 4 Series Convertible is a hardtop convertible with 2 passenger doors and seating a maximum of 4 people, with a price starting at $52,950. Running on Premium, the 430i 4 Series Convertible gets 24 MPG City, 34 Highway MPG, for a combined 27 MPG. The 2019 BMW 440i 4 Series Convertible is a hardtop convertible with 2 passenger doors and seating a maximum of 4 people, with a price starting at $60,000. Running on Premium, the 440i 4 Series Convertible gets 21 MPG City, 29 Highway MPG, for a combined 24 MPG. The 2018 BMW 640i 6 Series Convertible is a softtop convertible with 2 passenger doors and seating a maximum of 4 people, with a price starting at $86,700. Running on Premium, the 640i 6 Series Convertible gets 20 MPG City, 29 Highway MPG, for a combined 23 MPG. The 2018 BMW 650i 6 Series Convertible is a softtop convertible with 2 passenger doors and seating a maximum of 4 people, with a price starting at $98,300. Running on Premium, the 650i 6 Series Convertible gets 17 MPG City, 25 Highway MPG, for a combined 20 MPG. The 2018 BMW M240i 2 Series Convertible is a softtop convertible with 2 passenger doors and seating a maximum of 4 people, with a price starting at $50,050. Running on Premium, the M240i 2 Series Convertible gets 21 MPG City, 30 Highway MPG, for a combined 24 MPG. The 2018 BMW M4 Convertible is a hardtop convertible with 2 passenger doors and seating a maximum of 4 people, with a price starting at $77,200. Running on Premium, the M4 Convertible gets 17 MPG City, 25 Highway MPG, for a combined 20 MPG. The 2019 Buick Cascada is a softtop convertible with 2 passenger doors and seating a maximum of 4 people, with a price starting at $33,070. Running on Premium, the Cascada gets 21 MPG City, 29 Highway MPG, for a combined 24 MPG. The 2018 Chevrolet Camaro Convertible is a softtop convertible with 2 passenger doors and seating a maximum of 4 people, with a price starting at $32,900. Running on Premium, the Camaro Convertible gets 22 MPG City, 31 Highway MPG, for a combined 25 MPG. 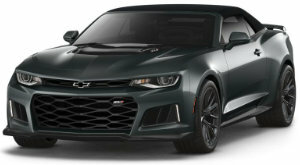 The 2018 Chevrolet Camaro SS Convertible is a softtop convertible with 2 passenger doors and seating a maximum of 4 people, with a price starting at $43,995. Running on Premium, the Camaro SS Convertible gets 17 MPG City, 27 Highway MPG, for a combined 20 MPG. The 2018 Chevrolet Camaro ZL1 Convertible is a softtop convertible with 2 passenger doors and seating a maximum of 4 people, with a price starting at $68,495. Running on Premium, the Camaro ZL1 Convertible gets 14 MPG City, 20 Highway MPG, for a combined 16 MPG. The 2018 Ferrari Portofino is a hardtop convertible with 2 passenger doors and seating a maximum of 4 people, with a price starting at $210,783. Running on Premium, the Portofino gets 16 MPG City, 23 Highway MPG, for a combined 18 MPG. The 2017 FIAT 500c is a softtop convertible with 2 passenger doors and seating a maximum of 4 people, with a price starting at $16,490. Running on Premium, the 500c gets 31 MPG City, 38 Highway MPG, for a combined 34 MPG. The 2018 Ford Mustang EcoBoost Convertible is a softtop convertible with 2 passenger doors and seating a maximum of 4 people, with a price starting at $31,180. Running on Regular, the Mustang EcoBoost Convertible gets 20 MPG City, 29 Highway MPG, for a combined 23 MPG. The 2018 Ford Mustang EcoBoost Premium Convertible is a softtop convertible with 2 passenger doors and seating a maximum of 4 people, with a price starting at $36,195. Running on Regular, the Mustang EcoBoost Premium Convertible gets 20 MPG City, 29 Highway MPG, for a combined 23 MPG. The 2018 Ford Mustang GT Premium Convertible is a softtop convertible with 2 passenger doors and seating a maximum of 4 people, with a price starting at $44,690. Running on Regular, the Mustang GT Premium Convertible gets 15 MPG City, 24 Highway MPG, for a combined 18 MPG. The 2018 Jeep Wrangler is a softtop SUV, a convertible with 2 passenger doors and seating a maximum of 4 people, with a price starting at $27,495. Running on Regular, the Wrangler gets 17 MPG City, 25 Highway MPG, for a combined 20 MPG. The 2018 Jeep Wrangler JK is a softtop SUV, a convertible with 2 passenger doors and seating a maximum of 4 people, with a price starting at $23,995. Running on Regular, the Wrangler JK gets 17 MPG City, 21 Highway MPG, for a combined 18 MPG. The 2018 Jeep Wrangler JK Unlimited is a softtop SUV, a convertible with 4 passenger doors and seating a maximum of 5 people, with a price starting at $27,895. Running on Regular, the Wrangler JK Unlimited gets 16 MPG City, 20 Highway MPG, for a combined 18 MPG. The 2018 Jeep Wrangler Unlimited is a softtop SUV, a convertible with 4 passenger doors and seating a maximum of 5 people, with a price starting at $30,995. Running on Regular, the Wrangler Unlimited gets 17 MPG City, 25 Highway MPG, for a combined 20 MPG. The 2018 Land Rover Range Rover Evoque is a softtop SUV, a convertible with 2 passenger doors and seating a maximum of 4 people, with a price starting at $52,100. Running on Premium, the Range Rover Evoque gets 21 MPG City, 29 Highway MPG, for a combined 24 MPG. The 2017 Maserati GranTurismo Convertible is a softtop convertible with 2 passenger doors and seating a maximum of 4 people, with a price starting at $145,740. Running on Premium, the GranTurismo Convertible gets 13 MPG City, 20 Highway MPG, for a combined 15 MPG. The 2018 Mercedes-Benz AMG C43 Cabriolet is a softtop convertible with 2 passenger doors and seating a maximum of 4 people, with a price starting at $60,800. Running on Premium, the AMG C43 Cabriolet gets 19 MPG City, 26 Highway MPG, for a combined 22 MPG. The 2018 Mercedes-Benz AMG C63 Cabriolet is a softtop convertible with 2 passenger doors and seating a maximum of 4 people, with a price starting at $73,500. Running on Premium, the AMG C63 Cabriolet gets 17 MPG City, 22 Highway MPG, for a combined 19 MPG. The 2018 Mercedes-Benz AMG S63 Cabriolet is a softtop convertible with 2 passenger doors and seating a maximum of 4 people, with a price starting at $179,500. Running on Premium, the AMG S63 Cabriolet gets 15 MPG City, 24 Highway MPG, for a combined 18 MPG. The 2018 Mercedes-Benz AMG S65 Cabriolet is a softtop convertible with 2 passenger doors and seating a maximum of 4 people, with a price starting at $250,900. Running on Premium, the AMG S65 Cabriolet gets 14 MPG City, 21 Highway MPG, for a combined 16 MPG. The 2018 Mercedes-Benz C300 Cabriolet is a softtop convertible with 2 passenger doors and seating a maximum of 4 people, with a price starting at $51,200. Running on Premium, the C300 Cabriolet gets 22 MPG City, 29 Highway MPG, for a combined 25 MPG. The 2018 Mercedes-Benz E400 Cabriolet is a softtop convertible with 2 passenger doors and seating a maximum of 4 people, with a price starting at $66,300. Running on Premium, the E400 Cabriolet gets 20 MPG City, 26 Highway MPG, for a combined 22 MPG. The 2018 Mercedes-Benz S560 Cabriolet is a softtop convertible with 2 passenger doors and seating a maximum of 4 people, with a price starting at $133,300. Running on Premium, the S560 Cabriolet gets 17 MPG City, 26 Highway MPG, for a combined 20 MPG. The 2018 MINI Cooper Convertible is a softtop convertible with 2 passenger doors and seating a maximum of 4 people, with a price starting at $26,900. Running on Premium, the Cooper Convertible gets 28 MPG City, 37 Highway MPG, for a combined 32 MPG. The 2018 MINI Cooper S Convertible is a softtop convertible with 2 passenger doors and seating a maximum of 4 people, with a price starting at $31,400. Running on Premium, the Cooper S Convertible gets 25 MPG City, 33 Highway MPG, for a combined 28 MPG. The 2018 MINI John Cooper Works Convertible is a softtop convertible with 2 passenger doors and seating a maximum of 4 people, with a price starting at $37,400. Running on Premium, the John Cooper Works Convertible gets 25 MPG City, 33 Highway MPG, for a combined 28 MPG. The 2018 Porsche 911 Carrera Cabriolet is a softtop convertible with 2 passenger doors and seating a maximum of 4 people, with a price starting at $103,400. Running on Premium, the 911 Carrera Cabriolet gets 22 MPG City, 28 Highway MPG, for a combined 24 MPG. The 2018 Porsche 911 Targa 4 is a targa top convertible with 2 passenger doors and seating a maximum of 4 people, with a price starting at $110,300. Running on Premium, the 911 Targa 4 gets 22 MPG City, 28 Highway MPG, for a combined 24 MPG. The 2017 Rolls-Royce Dawn is a softtop convertible with 2 passenger doors and seating a maximum of 4 people, with a price starting at $341,125. Running on Premium, the Dawn gets 12 MPG City, 19 Highway MPG, for a combined 14 MPG. The 2017 Rolls-Royce Phantom Drophead Coupe is a softtop convertible with 2 passenger doors and seating a maximum of 4 people, with a price starting at $492,000. Running on Premium, the Phantom Drophead Coupe gets 11 MPG City, 19 Highway MPG, for a combined 14 MPG. The 2018 Volkswagen Beetle Convertible is a softtop convertible with 2 passenger doors and seating a maximum of 4 people, with a price starting at $25,440. Running on Regular, the Beetle Convertible gets 26 MPG City, 33 Highway MPG, for a combined 29 MPG. Featuring the allure of a convertible and the all-weather convenience of a coupe, nothing compares to hardtop convertibles. Tesla Motors' sporty all-electric convertible shows you can be green in style with green convertibles! Check out the newest in environmentally friendly green cars featuring new hybrids, electric, diesel, and more! In no case does OnlyDriveConvertibles.com make claim to intellectual property rights associated with vehicle manufacturers or associated affiliates.